How to Stop Eating Sugar and Break Sugar Addiction Once and For All? Here is the plan that I’ve used to break my sugar addiction and stop eating cookies and sweets and drinking caramel lattes every day. I had so much of the sweet stuff when I was a kid that I’ve developed hypoglycemia. In other words, if I don’t eat at regular hours I tend to turn into a gremlin; and if I wait a bit longer I become as pale as a vampire and sluggish like a zombie; not exactly the lively, exciting woman I want to be. Cutting out sugar became vital for me, and below I show you how I did it. 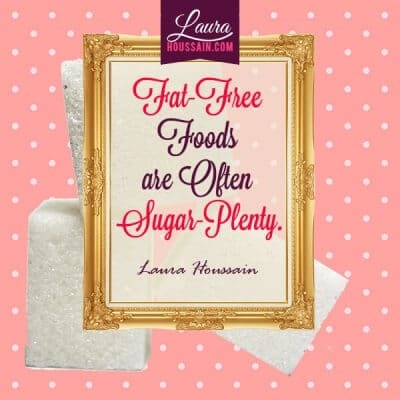 I still have a little sugar from time to time but in much more controlled and manageable amounts. It makes me much friendlier and pleasant to be around with. I sleep better; my teeth are healthy. I can’t count the blessings I’ve received by putting an end to eating a lot of sugar. Now it’s your turn to enjoy these blessings. Read on. When it comes to sugar cravings, a few obvious causes come to mind. First, your brain is trained to prefer sugar at birth. Your palate changes throughout your life, but you are born with a sweet tooth. Also, sugar releases soothing hormones that uplift your mood and give you a boost. Then, there’s also the reward trigger. Parents often train their children to feel good when eating sugar by providing sweets in exchange for good grades or deeds or just for being a good boy or girl. 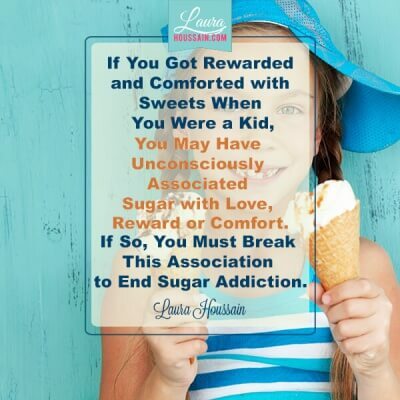 This creates pathways in the brain that equate sugar with being accepted and rewarded. As adults, sugar becomes a way to get back to that feeling of belonging and deservedness. It can become a strategy to relieve stress when life seems out of control, beyond our grasp or when we feel rejected. I remember watching a movie in which a woman said she would immediately reach for the ice-cream bucket after being dumped. I had a client who used to literally rush to the supermarket to buy candy bars, sodas, and chocolate each time he felt his financial security was at stake. Whether you are feeling uncertainty, stress, or rejection, you may have learned that sugar is the only way you can return to feeling safe, at home, and accepted. Lastly, if you have taken on the habit of eating sugar-filled foods regularly, you will experience withdrawal symptoms that only sugar seems to alleviate. I have experienced that feeling and mistook it for a panic attack. It happened when I was living in New York City. I was finding the city very stressful. I felt homesick and very insecure. Everything seemed new and threatening. I started eating fat-free foods, lattes, and baked goods, which are all filled with extra sugar. Then, to gain a sense of control over my sugar consumption, I started using chemical sugar substitutes and drinking sugar-free sodas. This made things even worse. My stress levels shot up, and I was craving sugar even more. I experienced burn out, and my formerly healthy teeth started rotting one after the other. Sugar had tricked me and never really delivered on its promise to make me feel safe or at home. It did for a few short moments, but I ended up needing more and more, like a junky. If my story seems familiar, maybe you have been using sugar as an emotional eater. You may not feel the emotion behind the sugar cravings, but that doesn’t mean there isn’t an emotional dimension to it. Sugar is addictive by itself. But I believe you get addicted to the emotion or sensation sugar procures 90 percent more than to the substance itself. Sugar is hidden in most of the food we eat. It becomes very easy to get used to that sweetness. When I arrived in the U.S., I noticed that portions were a lot bigger and everything tasted much sweeter. My mom had raised me with home-cooked meals, and I had taken on the habit of cooking my own food. So far, I had escaped the added sugar hidden in processed foods. However, with a deli at every corner and supermarkets open 24/7, I fell into the convenience food trap. I started eating out or ordering in more, adding loads of sugar to my diet. I would sometimes skip a meal and have a cappuccino and a muffin instead. I didn’t realize that a frappucino could contain 58g of sugar and a latte 17g. If you want to learn how to stop eating sugar, you have to learn which foods contain the most sugar and almost ban them from your diet. The American Heart Association’s daily recommended limit for sugar is 6 tsp for women and 9 tsp for men. The average American consumes an average of 22 tsp of added sugar per day. I personally recommend switching to eating home-cooked meals with low fructose ingredients. How To Break A Sugar Addiction with a Simple Step-by-Step Plan. I know that telling you to stop eating sugar, even hidden sugar, is not enough. 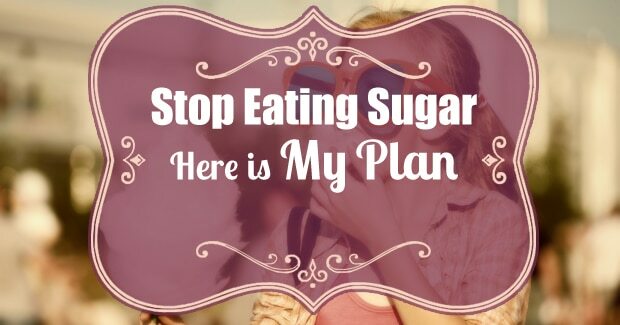 You need a plan to stop, especially if you’ve been “emotionally addicted” to sugar for years. My sugar addiction vanished permanently once I took care of the emotional side of eating sugar. But I’ve also used simple techniques to help me along the way. Of course, the first thing you need is a firm decision and the commitment to persist until you break free. Here is what I did to eliminate my sugar addiction. Drink a lot of water: My first recommendation is that you start drinking a lot of water right after eating sugar and throughout the day. It seems that sugar dehydrates the body and that causes even more sugar cravings. Drink as much water as possible, at least 10 but ideally 20 glasses a day. I know it may seem like a lot, but your health will improve almost instantly and your cravings will diminish. I also know it may seem overly simple, but it’s extremely efficient. Do this for 21 days and share the results with me here. Balance your sugar levels naturally: I suffer from hypoglycemia. I believe it’s because I ate way too many sweets growing up. I take cinnamon mixed with dehydrated wheat grass juice daily. It looks disgusting, but it tastes OK, and it seems to balance my sugar levels. I have also noticed that taking nigari water, which is a great source of magnesium chloride, seems to bring me peace of mind, help me sleep better, and balance my reaction to sugar. I make the water by mixing 22g of Nigari in a liter of water, but sometimes I just add one quarter of a cappuccino spoon to a glass of water and drink. I must warn you. It tastes awful, but it’s the only form of magnesium I know that gives me instant calmness. I usually take it at night, one glass, an hour before bedtime. You may have to find your own plants and supplements to help balance your blood sugar levels. These two are working for me. Stop eating after dinner: If you don’t, you will be in the middle of a sugar high when you’re going to bed. This will decrease the quality of your sleep. Then, the next day, you’ll be tempted to drink coffee and eat sweet foods to give you a boost. If you just can’t help yourself, read on. I’ll give you more tips for dealing with the emotional eating aspects of a sugar craving. Eat fresh vegetables first: This trick helped me move away from sugar cravings after I returned to France. I switched back to eating home-cooked meals and would force myself to eat either celery or organic carrot sticks before having a cookie or eating sweets. I did have the cookie or sweets after, but slowly my brain learned to nourish myself with fresh food first. It has to be something fresh and not too sweet. Some compulsive dieters tend to eat various diet-friendly foods instead of the food they’re craving until they give in. If that’s you, make sure you have one carrot or piece of your favorite vegetable and then eat exactly what you’re craving immediately after. Drink licorice tea: Licorice tea has a sweet taste without any sugar content. I like drinking it regularly. It can increase blood pressure if overused, so use it moderately. Eliminate sugar-free additives and sodas: As I explained above, my sugar addiction grew exponentially after adding sugar-free drinks to my diet. Eliminate aspartame, sorbitol, and other chemical sweeteners from your diet. They trigger sugar craving responses almost impossible to resist. Eat sugar, but don’t drink it: If you are craving sugar, always go for solid foods, chew slowly, and then drink loads of water. That’s not how to quit the sweet stuff, but it’s a good transitional strategy. After a while, you will stop eating sugar entirely. People tease me at parties because I only drink sparkling water. It’s because I know how quickly sweet beverages, including soft drinks, cocktails, and alcoholic drinks, are absorbed. They usually give me this huge sugar rush and then make me feel extremely drowsy. I sometimes have champagne, but only occasionally. Fizzy or sparkling beverages make sugar and alcohol enter the bloodstream faster, so avoid them as much as possible. Here is a simple step-by-step plan to stop sugar addiction using coaching techniques. If you want to succeed, you have to combine all the tools and use them simultaneously. But, you can take the time to learn them one after the other and enjoy the improvement along the way. Step One: Manage Your Stress Levels: If you use sugar regularly to alleviate stress or anxiety, you may experience temporary relief each time, but you’re actually increasing your overall stress levels. Sugar highs and lows strain your hormonal system, so you may end up feeling more drained than ever and be tempted to drink coffee. Coffee and sugar is the worst combination possible. It causes acidity in the stomach, troubles your digestion, causes mood swings, and disrupts your sleep. I stopped drinking coffee when I quit smoking. I may have it once a year but that’s about it. It makes my heart race; it used to turn me into a nervous wreck. Instead of taking coffee, get in the habit of exercising daily, and drink a lot of water. Brisk exercise is best. If you can’t do it every day, do it three times a week, even if it’s just for a few minutes. Another way to ban stress is to practice meditation daily. The technique I recommend is very simple and lasts only eight short minutes. Practiced twice a day it can do wonders to your stress levels. It’s very simple to learn and will give you immediate results on your cravings. (read on to get access to it). Step Three: Bust Your Sugar Cravings: One of the easiest ways to stop sugar cravings is practicing EFT. I give my newsletter readers access to a short video series that can help them stop most food cravings. It’s also great to help you reduce stress. Try it. It’s very simple and pleasant to do. Click here to get immediate access to my 8-minute craving busting technique training videos. You’ll also receive coaching updates if this is what you want. Step Six: Mind Your Focus: Obsessing on foods is one of the reasons why you overeat. It’s actually been proven that the more you think about food, the hungrier you feel. What you want to do is focus on getting what you want in life without foods. Sugar and sweets only help you suppress negative emotions or stress temporarily. When you do that you’re missing the opportunity to provide yourself with what your heart and soul really need. It takes practice, but with a little time, you can learn to focus on what matters and not only stop sugar overeating but actually feel happy and have a life that fulfills you. Learn how you can do this now here: How to Stop Compulsive Eating and Food Obsessions. Ignore This and You’ll Fail! Conclusion: As you can see, there are many small steps you can take to stop eating sugar. This article is to help you getting started. You want to do this gradually over time, but very consistently. Ultimately, you will eliminate all sugars from your diet. But, don’t hesitate to take baby steps. It can be very simple and take you as little as eight minutes a day three times a day. Make sure to subscribe to my newsletter below to get the awesome techniques I have mentioned here. Answer one question and enter your first name and email and click on the button. You’ll just love having that sense of control and inner peace. I would like the link to the meditation and the EFT please. You obviously know there is no where to subscribe at the bottom of this article. Thank you for letting me know. I have updated my blog post with access details and invited you to my free coaching updates and EFT training. Enjoy! And if that’s not what you wanted, just unsubscribe yourself. I like to eat, I enjoy it… it is like an addiction. It is a thing you have to work day by day. however I am finally beginning to break that habit. I started juicing and cut sugar!